The ability to create and evaluate content on at least one digital or media platform related to a specific communication initiative and audience. It is too hard to narrow this category to just one example. One of the real strengths of this program is that it stretches its students not just to understand the latest tools, but to actually put them to use. 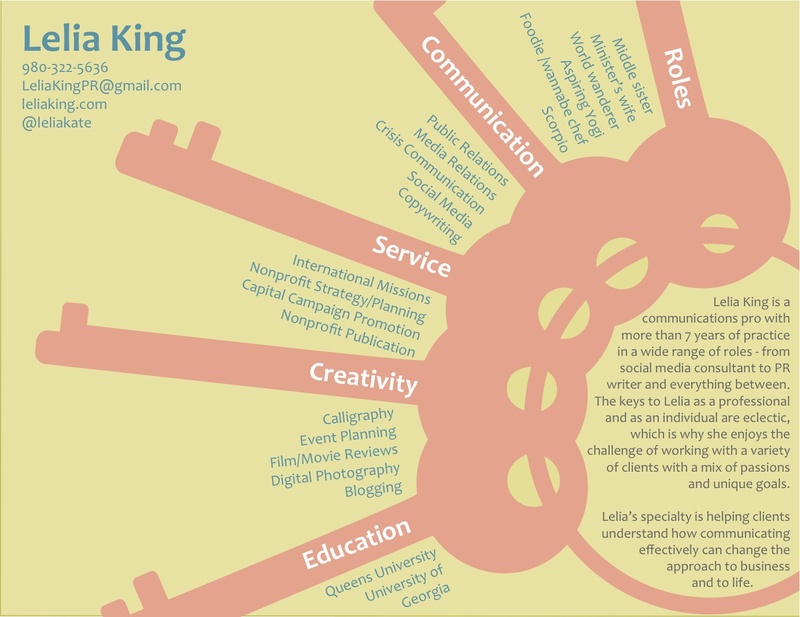 As part of my coursework, I have presented using Pecha Kucha style and Prezi, I have created an infographic resume and a Pinterest board, created videos and blogs and learned about even more digital and media programs from my colleagues. One of my favorite projects in grad school has been creating an infographic resume as part of COMM635, Organizational & Employee Identity. In the course, we learned about using symbols to represent data, and we then applied that idea to the resume. In fact, I wrote about this project in a previous blog post. Though you should be impressed that I was able to create this using my very limited graphic design skills (kudos again to my design guru, Courtney), the more impressive thing is that this helped me land my new job with Charlotte Center City Partners. It wasn’t about this infographic per se, it was about the fact that I was using my graduate school experience to expand my own communication barriers, and that is a skill that many employers today are looking for. Creativity, innovation, out-of-the box thinking…this program has allowed me to explore so many different ways of learning. We wrote our share of 15-page papers, but that isn’t all we did during our time as students here! It was in this same course that we created Pinterest boards to help represent our identities. Click here for a glimpse of my Pinterest board.